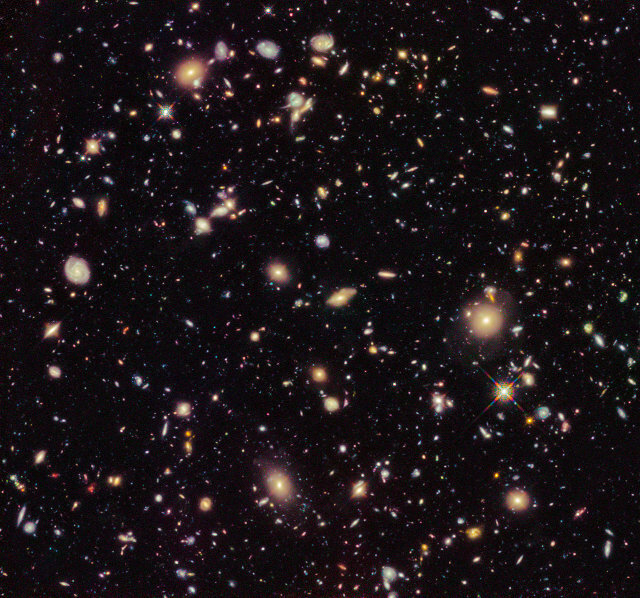 A series of articles to be published in “Astrophysical Journal” and “Monthly Notices of the Royal Astronomical Society” describe different parts of a research based on the observation of the Hubble Space Telescope’s Ultra Deep Field (HUDF) using the radio telescope ALMA. These observations show that the rate of star formation in young galaxies is closely related to their total mass in stars. Those images captured by Hubble have been extensively studied over the years but some astronomers decided to go further using the knowledge gathered to observe the faint glow of gas clouds and the emission of hot dust in galaxies of the early Universe in the Ultra Deep Field area. To achieve these results, the astronomers used ALMA (Atacama Large Millimeter / submillimeter Array), the largest radio telescope in the world, observing for the first time that area in the millimeter band. Inaugurated in March 2013, ALMA has an extraordinary sensitivity perfect to look at star-forming clouds and other objects that are too weak at visible light while they’re bright at wavelengths detectable by ALMA. A team of researchers led by Jim Dunlop of University of Edinburgh used ALMA to get the first deep and homogeneous image of a region as large as that of the Ultra Deep Field. The data allowed to combine with certainty the galaxies detected with objects already seen with the Hubble Space Telescope and other instruments as well. This study suggests that star formation in those galaxies is connected to their total mass in stars. The second team of researchers, led by Manuel Aravena of the Núcleo de Astronomía, Universidad Diego Portales, Santiago, Chile, and Fabian Walter of the Max Planck Institute for Astronomy in Heidelberg, Germany, conducted a more in-depth research on a wide area around a sixth of the total Ultra Deep Field. The result was the discovery of a population of galaxies that is not clearly evident in any deep sky survey. Some of the observations with ALMA were conducted specifically to detect galaxies rich of carbon monoxide, which identifies regions ready for star formation. They’re often very difficult to see with Hubble while ALMA can detect them allowing astronomers to study them. 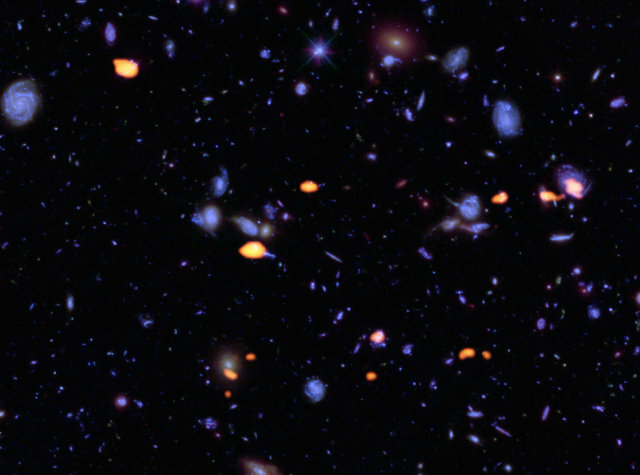 Going farther into space with the observations, astronomers can see further back in time and noticed an increase in gas content in the galaxies. This is probably the main cause of the peak of star formation that occurred about 10 billion years ago. This observation campaign has already brought results but it’s just the beginning of a series of studies on the history of star formation. The observations made with two extraordinary instruments such as the Hubble Space Telescope and the ALMA radio telescope can complement each other and taking advantage of their features it’s possible to get much more extensive and complete results.